These chocolate coconut birds nests are a quick and easy Easter treat to make with your kids or put out after Easter dinner. If you like a traditional macaroon cookie you can leave them plain as well, either way I am a huge fan of Easter candy so I love any opportunity to use Cadbury mini eggs!! 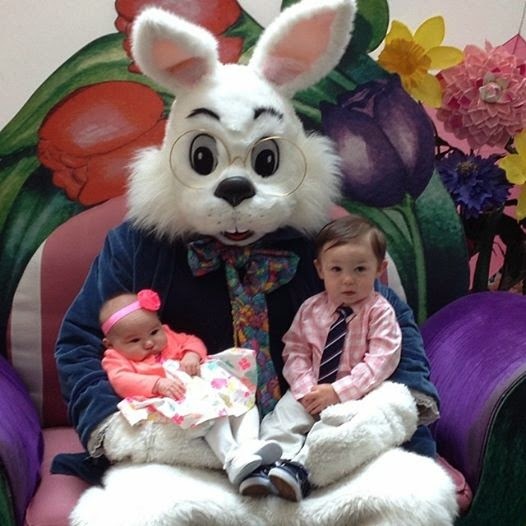 I couldn't resist sharing Owen & Madelyn's 1st Easter Bunny picture with all of you!! Since Easter is on Sunday and Passover has been these last few days we wanted to take a moment and wish all of our followers a Happy Spring Holiday season. I know we are excited for Easter here in this house! We attempted to dye eggs with Owen for the first time today and we will be taking him to his first Easter Egg Hunt on Saturday. I love now that he's a little older we can really start some family traditions that he'll hopefully enjoy in the years to come. Start by preheating your oven to 325 F. In the stand mixer bowl whisk the egg whites with the vanilla, sugar and salt for a few minutes on a medium-high speed until the mixture if foamy and glossy. Gently fold in the shredded coconut flakes. I made half the batch regular and half chocolate so I didn't add the cocoa powder till I made a few plain nests first. If I was making the whole batch chocolate I would've thrown the cocoa powder in with the egg white mixture in the beginning. Drop the mounds of coconut on the baking tray about 2 inches a part. You can use a large spoon or a small ice cream scoop for this, make sure they are tightly pushed together and then make a small indent to place the eggs into. Bake 20 minutes, rotating the pan half way through until they look to be slightly browned and crispy on the outside. Allow them to cool for about 5 minutes on the tray then transfer them to a baking rack. Store in the fridge for 5 days or on the counter for 3. Hi Nicole, Thanks for sharing on Foodie Friends Friday's Easter Party this week. I love macaroons and you've made yours so festive for Easter. Pinned/shared.